News bites, scoops, and Snausage links- a regular feature. Tips welcome- I’d love to post yours! – Furries Frolic In San Francisco: Queerty news. The influential monthly Furry club night, Frolic, has a story on Queerty. (It’s hosted at a historic gay bar, due to their friendliness to subculture.) Next week, July 25, Frolic hosts it’s popular 4th annual special outdoor event for 100-200 attendees, Furries In the Wild. 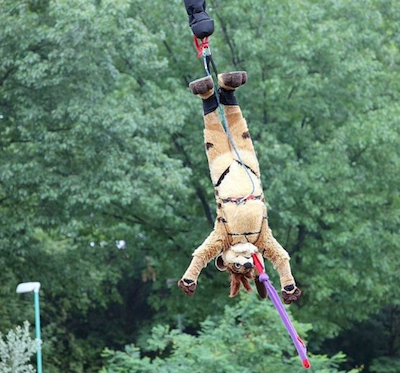 – Fursuit Bungee Jumping in Germany. – Furries in music videos this week. Weird Al’s “Tacky” has ears and rainbow tail on background actors at 1:40. In San Francisco, indie rapper MC Crumbsnatcher made the fourth music video in a grossout-humor themed series full of furry performers. (I acted in Husky suit with another actor dressed in a toilet suit- I drank from the bowl and got whacked with a newspaper.) Video production came from a furry-run studio, and DJ Neonbunny of Frolic. – MONGRELS puppeteers are Guests of Honor for Further Confusion in January 2015. Reshare: TV and movie puppeteers from the UK show “Mongrels” are announced as the con’s Guests of Honor. “The FIRST Foul-Mouthed Teddy?” InFurNation reports on a claim against the movie by a previous TV series. – Check out this other furry journalism! Contributors this edition include crossaffliction, dronon, earthfurst, Fred, InkyCrow and RingtailedFox. earthfurst Bill Watterson (creator of Calvin & Hobbes) did illustrations for 3 strips of Pearls Before Swine in early June. Fred: Brazil dresses dogs up for the World Cup. Small dogs only? Fred: Is the Borneo vampire squirrel really that adorable? Fred: The echidna is weirder than you think, besides having really big fleas. Fred: The Declaration of Independence might not have been approved on July 4th if not for horseflies. dronon: Steven Spielberg abandoned making an animated film adaptation of Andrew Lloyd Webber’s Cats musical. Too bad, because the development art looked great! Fred: Swarms of vampire finches. Run away! 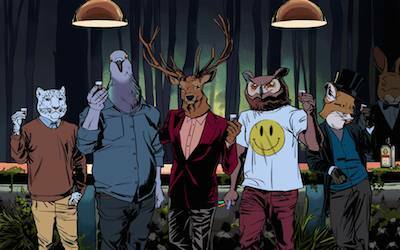 dronon: Not furry, but somewhat cartoon-related – this December there’ll be a documentary about voice acting and the people behind it: I Know That Voice! dronon: The English dub of Ernest & Celestine is now available on DVD. Fred: All about Baghi: The Monster of Mighty Nature. dronon: The tufted ground squirrel in Borneo has the bushiest tail relative to its body size. Fred: The French building that imitates an armadillo — but it’s not anthropomorphic. Fred: Police officer shoots aggressive tortoise; claims it broke into his house and attacked him. dronon: And so the merchandising begins: Rocket Raccoon mask. RingtailedFox: Wayne County bomb-sniffing dog put to rest after valiant struggle with congenital disease. crossaffliction: And you thought the Guardians of the Galaxy were obscure. Director James Gunn originally came to Marvel pitching a different furry character: Hit Monkey. dronon: Chinese animated film due in 2016 looks really interesting, even if the furry content turns out to be incidental: Master Jiang and the Six Kingdoms. Fred: Why the ancient Egyptians worshipped dung beetles. I’m not a drinker, so I came across the Jagermeister logo more recently in life. It seems very absurd but somewhat furry to use a stag with a Christian cross radiating out from behind the antlers as the logo. There’s some creepy, cryptic background to that drink… wiki has it all: http://en.wikipedia.org/wiki/J%C3%A4germeister – I don’t know what it means, but Volkswagens and Autobahns have their weird nazi associations too. Well, I do like it, but I prefer Fernet. It’s very herby, but not nearly as syrupy.